Easy access, space efficiency, and smooth wrinkle-free pants, that's what you get with the Synergy Pull-Out Pants Racks from Hafele. No more trying to fish a pair of wrinkled pants from the bottom of an unwieldy stack - just slide out the rack and lift the pants off the hanger or slip the hanger off the rack entirely. Every pair is readily visible, and hangs freely with no sharp folds. The racks ride on full-extension slides and come in three different widths, each with a set of unique no-swing hangers that keep your pants from tipping off: 18"W (12 hangers), 24"W (18 hangers) and 30"W (24 hangers). The racks come in a dark oil-rubbed bronze finish to interface seamlessly with other Hafele accessories. 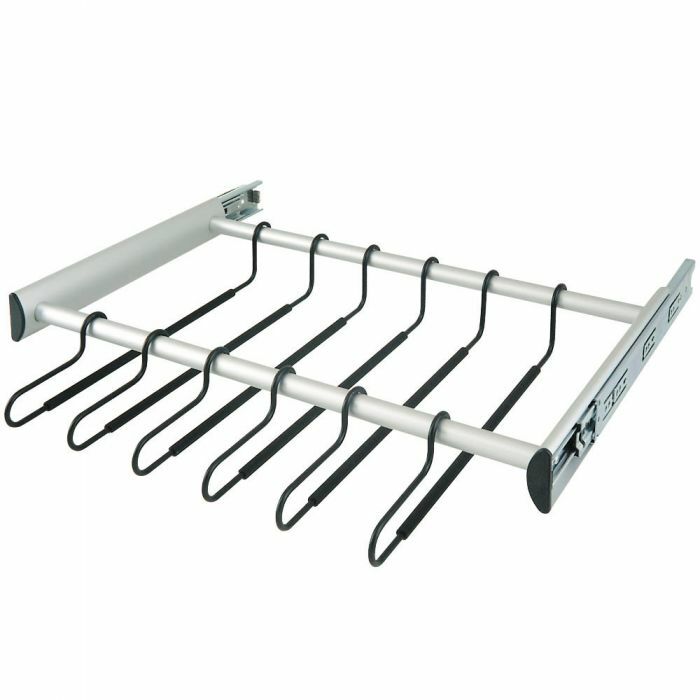 All racks are 13-15/16" deep x 2-5/16" wide with the hanger included.